The founders and the faculties rigorously worked hard to transform the students into polished diamonds serving the nation. Perfection worked with dedication under one roof that resulted from one classroom to nineteen classroom, two staffs to fifteen, one course to eleven course and most importantly these THREE pillars have multiplied themselves to a cluster of twenty elite faculties. The beginning in year 2007 was with just Chartered Accountancy Course but gradually within few years, the institute has explored other fields too. In Year 2009, it started XI, XII, and B.COM. In Year 2011 it commenced Company Secretary Course. In the year 2013, CMA(CWA) course started. The Institute has produced best students in the past due to its high standards of faculty, resources and infrastructure. Today it is growing in a big way as a premier Institution which guides the students to do well in challenging professional courses. The excellent performance of our students and the dedicated efforts of our faculties make the institute a perfect choice for an individual aspiring to build a career in professional courses. For Extra ordinary and Valuable Contribution in the Field of Education, We have been awarded as Best Institute of Central India by Honourable Chief Minister of CG and New 18 TV Channel in 2018. Our Efforts has been appreciated at many Occasions through Award and Honour by My FM Radio, Honourable Governor of CG and Other Entities. 1. The Student base which started from 200 in year 2007 is now at a whopping 3000 students every year. 2. The fragrance of success is simply not restricted to our own state CG but has spread among the nearby states (M.P., Orissa etc.) too. 3. 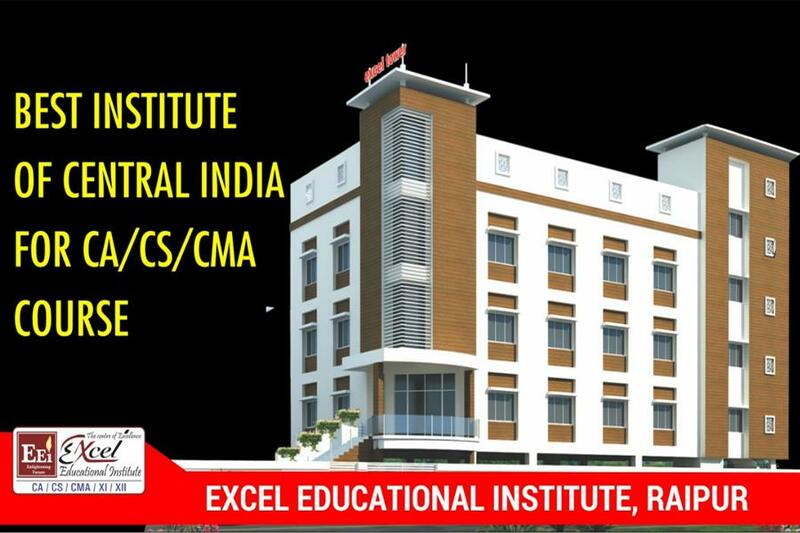 Excel has produced 92 All India Rank Holders to prove their acumen in teaching professional courses. 4. As of now, more than 11000 students have achieved success in different level of CA/CS/CMA Exams and finally EXCEL feels proud to add more than 650 qualified CAs in the wing of CAs. 5. In the year 2018 total 37 students achieved All India Rank In CA CS Exam and Created history. In one single attempt of Nov /Dec 2018 Exam only, our 25 students achieved All India Rank in CA CS Found. And created a Unique record. 1. To honour our scholar students, we started “Honour of Excellence" ceremony in the year 2012. 2. Indoor Games were started in the year 2012 & Cricket tournament “Excel Premier Ledge” (EPL) started in the year 2013. 3. To create health awareness among students, We started organizing Blood Donation camp & Eye / Dental check up camp in the year 2014. Excel Olympiad comprises of Cricket, Kabaddi, Kho-Kho, Volleyball, Basketball, Race, Long Jump etc. started in the year 2016. 4. We Provide very Special & unique 24×7 Doubt Clearing facility. So that student can clear all his doubt during studies. 5. We provide Library, Reading Room and Group Discussion Hall Facility, So that they can get Educational and Positive Environment all time. 6. To keep Our Students charged with physical Fitness and Mental peace, we Started Jumba Yoga Activity also for all Students. 7. We Organise motivational session in all batches, so that students should always be full of energy and Confidence.